Verden. The collection of the Verden Auction on Saturday, January 20, 2018, features 105 riding horses and 10 stallions, born in 2015. Horses for almost all demands will be offered for sale as of 02.00 pm. The first horse of the year will be a black gelding by Don Frederic/Escudo (breeder and exhibitor: Henning Schulze, Tiddische): Dujardin is a dressage horse and the perfect example for the fact that an outstanding foundation line can produce both, dressage as well as show jumping horses. Auction no. two, Friedrich von Nymphenburg by Fürst Nymphenburg/Raphael (breeder: Otto Fuchs, Meinerzhagen – exhibitor: Helmut Freiherr von Fircks, Munich) is a gelding that already won medium level competitions. There are more horses in this collection that already successfully competed at tournaments so that their future owners will be able to immediately start into the next show season. Not only dressage and show jumping riders will have the chance to find a horse, but also pleasure riders and all those who want to start to train their new horse themselves. There will be 10 two-and-a-half-year old stallions to start under saddle and for further training purposes. All these futurity prospects do not only convince with their own dressage and show jumping capabilities, but also with their damlines. The stallions will be put up for auction with the numbers 111 to 120 after the riding horse with auction no. 52. 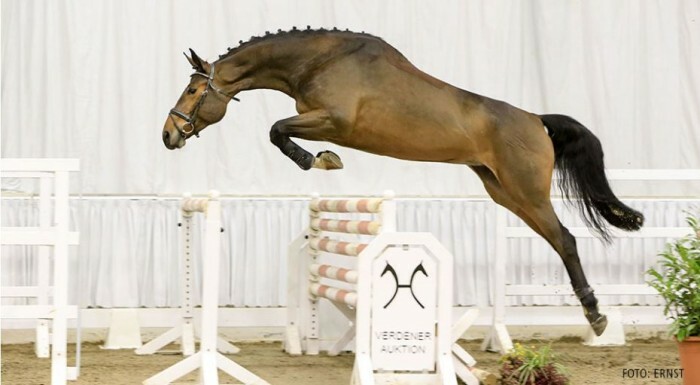 The auction horses will arrive in the Niedersachsenhalle in Verden on Monday, January 8. Training will start as of Tuesday, January 9. It will be possible to ride the horses every day upon prior arrangement with the customer advisors. The auction will start on Saturday, January 20, as of 02:00 pm. Tickets will be available in advance with www.ticketmaster.de as well as directly in Verden at Euro 10.